For centuries, the ship of the desert was the camel. With the invention of the automobile, this all changed. However, the typical automobile could not cross the desert without modifications. Fortunately Ralph Bagnold had been an avid desert explorer before the onset of World War II and knew a thing or two about operating a motor car in some of the harshest environments on the planet Earth. The LRDG truck was the result of a culmination of almost fourteen years of desert exploration before World War II. Specially fitted tires, a water condenser for the radiator, sand mats, sand channels, a sun compass, and numerous other modification made it possible for a small band of soldiers to accomplish what few men ever imagined could be accomplished. The LRDG trucks became a mobile oasis in the desert for the troops who relied on them. It was not uncommon for trucks to set out overloaded with as much as two tons or more of supplies. They would some times leave fuel and supply dumps in designated spots for future use. The usual crew for the 1 1/2 ton truck was three men, driver, gunner and commander. Of course these men also had other duties. For instance the commander may be the wireless operator, medical orderly, navigator, fitter (mechanic) and so on. And of course sometimes someone may swap off with the driver and give him rest. At first, the patrols had ten vehicles but this proved cumbersome and the letter patrols were divided into two numbered patrols. Hence Y patrol became Y1 and Y2 Patrols. This doubled the number of patrols and commanders as well as the number of other necessary personnel. When the patrols were divided the usual number of vehicles was six per patrol but this was based on the mission and also the availability of vehicles. All patrols set out with a wireless (radio) truck. At times a patrol may have as few four vehicles or have other vehicles attached increasing the total number of vehicles. When Lloyd Owen set out for the Tobruk raid he left with ten vehicles. According to his book, he left with six LRDG vehicles and four 3 tonners used by Haselden and the Commandos. 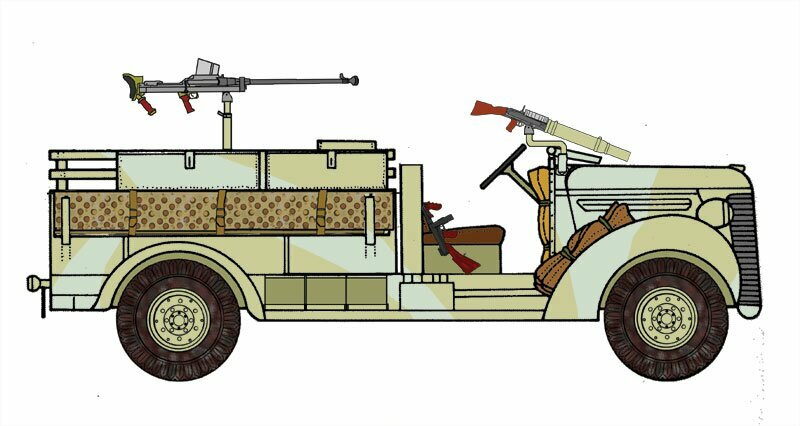 Below is a selection of the most important trucks used by the LRDG patrols. The first trucks used as a Standard patrol vehicles were locally procured. 1 ½ ton Chevrolets. 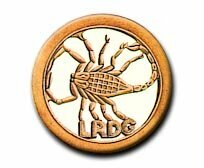 They proved successful but the LRDG thought they could do better. 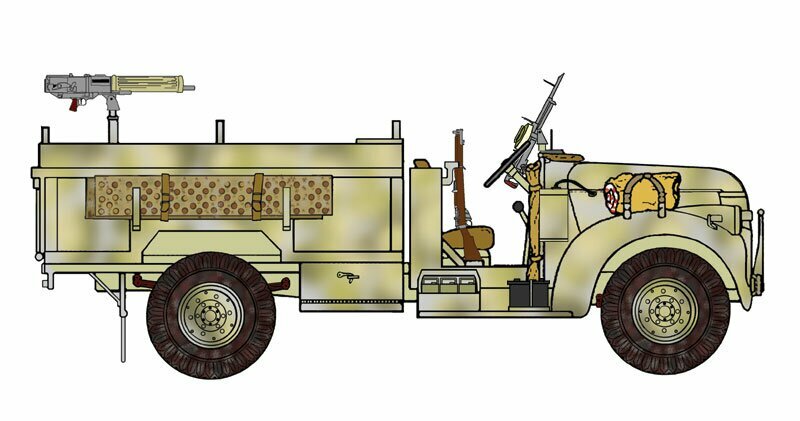 The principle design features that set these vehicles apart from other LRDG trucks are the horizontal grill and round fenders on the rear wheels. These trucks, along with other locally procured vehicles also had left hand steering. The usual armament was a Lewis Gun and a Vickers Maxim. Some trucks also carried the Boys AT rifle in place of the Vickers Maxim. One truck in the patrol mounted a Bofors QF anti-tank gun. 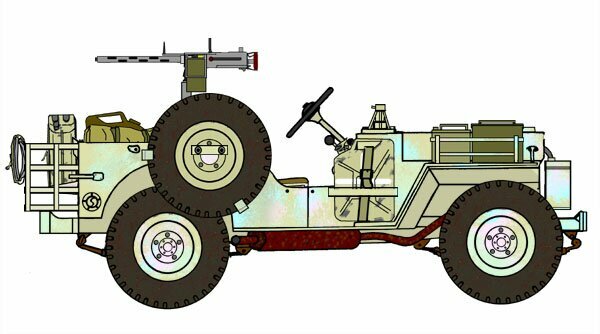 A Chevy WB carries a Lewis gun on a Swan Neck mount and the .55 in Boys on the center pintle. A Thompson submachine gun (normally referred to as the TSMG in official dispatches) rest in the cab. Engine: 216 CI 6 Cylinder inline. Camouflaged in azure stripes over middle stone the pilot car mounts a Vickers Maxim in front of the Commander's seat. Note the condenser on the fender. Max range with standard fuel tank: ?? The Ford F30 was a four wheel drive truck that replaced the earlier commercially produced Chevrolet 30 CWTs. A major advantage to the truck was its four wheel drive capability and the commonality of engine parts with the Ford Pilot Cars. Unfortunately, it was heavier than the Chevrolets and this caused many problems while on patrol. The four speed Flathead V8 managed a poor 6 miles per gallon which is probably the main reason it was replaced by the Chevrolet 1533X2 30 CWT. The fuel guzzling meant patrols needed to carry twice as much fuel or prepare more emergency fuel dumps in the desert. This additional fuel cut it into precious cargo space on the trucks. The Ford F30 was a Canadian military Pattern (CMP) truck specifically built for the British and Commonwealth forces. The cab over engine and four wheels were specifications set down by the British for easy of transportation and production. The engine was standard among all British Ford CMPs and many of the parts were interchangeable with Chevrolet CMPs. The LRDG strip the hood off the F30 to provide more air to the engine. A purpose built bed was also built. The vehicles were replaced by the Chevrolet 1533x2 30 CWT trucks but came out of retirement on at least two occasions due to shortages of the newer trucks. They remained popular with the LRDG but fuel consumption and additional weight were their down fall. An F30 sporting a dark gray/ desert pink mickey mouse camouflage pattern. It as a center mounted Vickers Maxim. Note the lack of hood. The headlights, however, were retained. Max range with standard fuel tanks: @150 Miles. After several false starts, the LRDG finally had an acceptable all around Patrol Truck. Once again the truck is two wheel drive. The 1533x2 used by the LRDG were purpose built military modifications of the 1 ½ ton YR series Chevrolet trucks. These modifications included a special truck bed as well as modifications to cab, front grill and suspension. Further modifications were made to the trucks once they reached the LRDG machine shops. Because the trucks were being made for the British Army they were now right hand drive. The popular "water fall" grill of the civilian truck was replaced by a grill with fewer slats to allow better air flow. By now the old Bofors guns used in the earlier trucks was being replaced by the Italian Model 35 Bredas. 1 in 6 trucks mounted a Breda. 1 in 6 trucks were also a radio truck. Tamiya released a model kit which has a "command car" towing a Breda. This is actually the W/T or Radio Truck which is not the commanders vehicle. Also the LRDG was not in the habit of towing guns on patrol, ever. 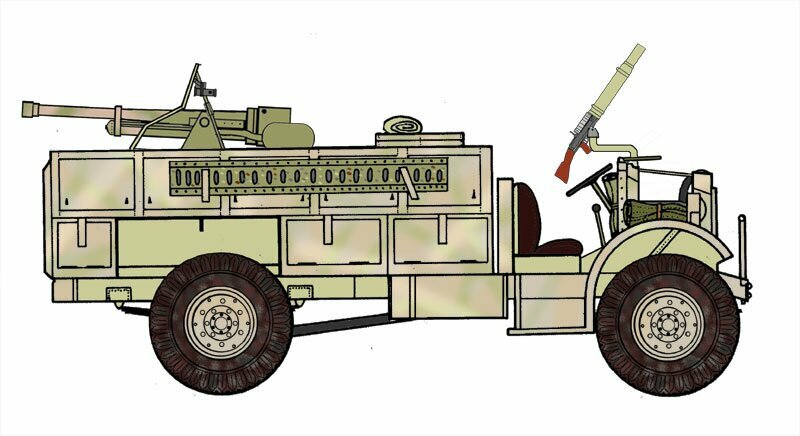 In the drawing above, the truck mounts a Vickers .5 inch heavy machine gun in the rear and a Vickers GO (Vickers K) on the passenger side. The Vickers .5 inch had two major drawbacks over the ANM2 Browning. It was water-cooled and its round was less powerful making it less effective against light tanks and armored cars. Its one advantage was reliability. The Vickers .5 inch was used to during the Barce Raid in September 1942. *In 1941, Chevrolet introduced a 235.5-cubic-inch version of their 216 engine which was used in their large trucks such as the 1 ½ tonners. Both the bore (3.5625” or 90.49mm) and stroke (3.9375” or 100.01mm) were increased over the old 216. With a wheelbase of 125 ¼ inches, the 1311x3 was larger than the Ford 01 but was rated at the same payload capacity of about 3/4 tons. It acted primarily as a pilot car until it was replaced by the Jeep. The 1311x3 was a purpose built version of the 1941/42 AK series Chevrolet ¾ ton pick-up truck . Among the modifications was a purpose built truck bed, cab, front grill, and suspension. While the truck looks similar to its larger cousin (the 1533X2) , it is significantly smaller. As a pilot car, the truck normally carried fewer supplies and armaments. It was also used as the Medical Officer's truck, surveying, and liaison work. 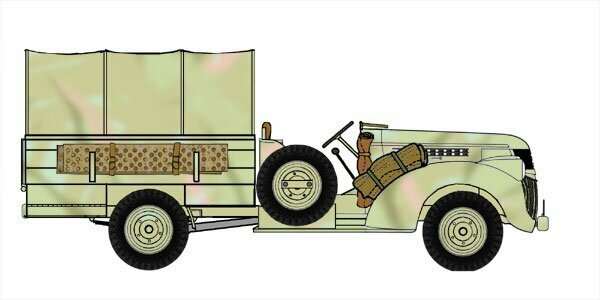 The LRDG and the SAS both came up with the idea of using Jeeps as patrol vehicles. Unfortunately for the LRDG, the SAS was the first in line to receive them. Eventually the LRDG would get their own issued Jeeps but until that happened they would find and repair SAS Jeeps and then put them to use. LRDG Jeeps tended to be used as pilot cars (patrol O/C and 2 i/c). They rarely stored fuel cans on the Jeep bonnet (hood) or above the rear wheels. They also tended to carry fewer weapons. Often only single MG or perhaps a twin mount. The first "Jeeps" to arrive in the Desert were Bantam BRC-40s. The First use of Jeeps by the LRDG was in September, 1942 during the Barce Raid. By this time the Willys MB had become the standard Jeep model. 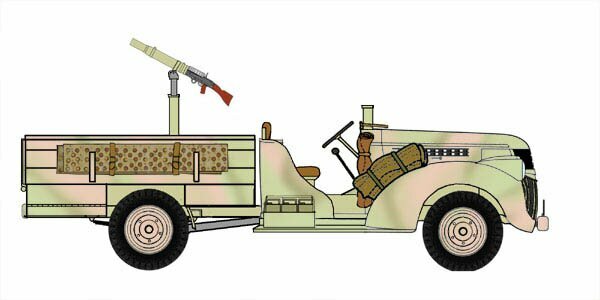 Despite being made principally by Willys and Ford, Commonwealth forces continued to call the Jeeps (including the Willys MB) Bantams throughout most of the desert war. The term Bantam was even used in official communications when requisitioning the Willys MB Jeep. It was not until after the arrival of Americans, that Commonwealth forces started calling the Willys MB a Jeep. 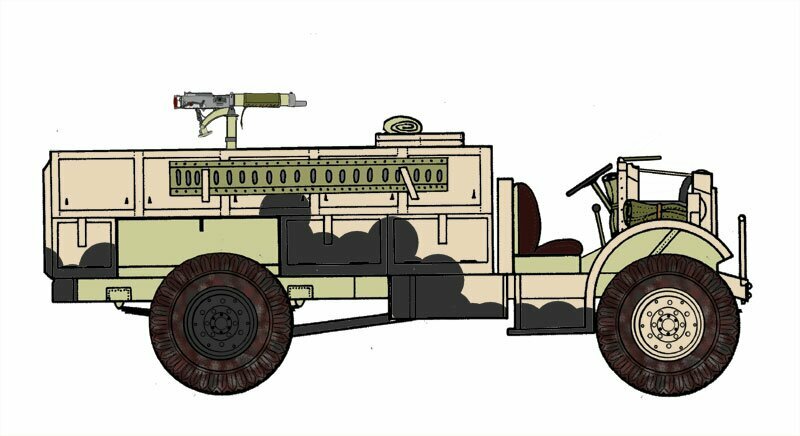 The drawing shows a typical LRDG Jeep. 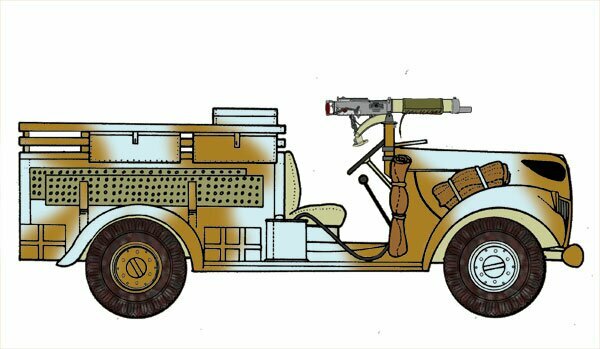 Side mounting the tyre was common among LRDG patrols; as were fender racks and side racks for fuel/water cans. Rear fender fuel can racks were common among Jeeps once used by the SAS. In the case of this "Bantam" a small stowage rack has been added across the back. Armament consist of twin .303 Brownings, however an additional mount has been affixed in front of the commander's seat. Note the lack of stowage on the bonnet. The LRDG quickly realized the need for protection against light armor and knew that the Boys AT rifle was not up to the job. Initially the unit mounted a Bofors 37mm QF anti-gun in the bed of the Chevrolet WBs and later F30 Ford. In the early stages of the war, the Bofors QF was capable of defeating any enemy armor vehicle. The Bofors also saw limited success on raids against enemy out posts. The main draw back of the Bofors was despite its name (QF stood for Quick Fire), it was a single shot anti tank gun. After the Italian defeat at Beda Fomm in February 1941, a large number of captured Breda Modello 35 20mm guns became available to Commonwealth forces. The Breda was considered a highly effective anti-tank/anti-aircraft gun and had a much higher rate of fire than the Bofors. Beside being able to effectively engage light tanks and armor cars it could offered a degree of protection from enemy aircraft. The Bredas were mounted in the new Chevrolet 1533x2 trucks. When the Ford F30s were brought out of mothballs, the Bredas replaced the old Bofors trucks. Each ½ patrol or roughly every sixth vehicle mounted a Bofors or Breda gun. Bofors Truck, and F30 Ford mounting a Bofors QF. The gun was mounted to fire toward the rear. In the case of the Bofors, its arc of fire was determined by the swing of the gun shield and the recoil of the barrel. which prevented firing to the front. The Breda truck (see top of page) required the sides of the truck to be altered to allow gun rotation. The higher front prevented gun depression when firing toward the front. The recoil of the guns was so powerful that it shortened the life of the truck and could lift the tires of the ground.. Had the trucks carried a radio, the recoil would have made it inoperable. The greatest diversity among vehicles was within the Heavy Section. The Heavy Section principle was role was re-supply, establishing supply dumps, and recovery work. In the beginning, a variety of trucks were used due to a shortage of vehicles in the theatre of operation. Eventually the Ford F60 (3 Tonner) became the principle vehicle of the Heavy Section. The 3 tonners, were standardized Ford CMPs used throughout the commonwealth. The standard chassis could be modified to carry mobile headquarters, with a stake bed could act as troop/supply carriers. They also acted as prime movers for heavy artillery. . Most were equipped with a winch mounted under the bed, feeding out toward the rear. LRDG three tonners also carried sand channels to assist in digging out the vehicles. 3 tonner mounting a single Vickers K in a make shift machine gun mount. In an attempt to lessen the sun's reflection, the front windshield is slanted inward. The HQ section and Survey section principally used vehicles common to the patrols. However in the case of HQ the vehicles were more lightly armed and carried smaller loads. Some vehicles, such as the MO (Medical Officer's) truck were modified to fill its specific job. Survey vehicles were often patrol vehicles carrying extra kit for cartography and surveying but would otherwise be the same as the standard patrol vehicles. The Medical Officer often accompanied patrols and as such needed reliable transportation. In some instances the MO just tagged along with the patrol and rode on a patrol truck. However, the MO did have vehicles. Pictured above is the first model MO truck built on a Chevrolet 1311x3 frame.